The hugely successful Covert Hook range has been subject to a radical face lift, incorporating a minimalist stripped back protective electroplated finish. This ensures that the hooks all have longer sharper tapered points which remain super sharp, an essential attribute for any effective rig. 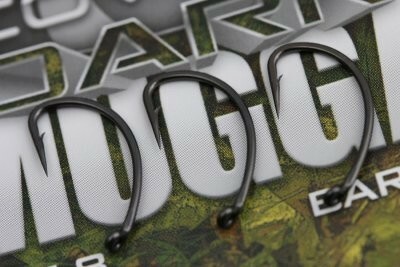 Finally, we have incorporated a micro barb to fall into line with the preferences of fisheries managers & owners. This final change also has a secondary benefit in terms of the hook’s raw strength, in that the shallower cut created as the micro barb is formed means that the high carbon forged wire retains greater strength/integrity. These patterns have long been stand alone favourites for many top anglers and we realistically expect the improvements to take these key patterns forward for years to come. The key to their enormous success is much more than a curved shank – the dynamic angle of penetration created between the position of the eye and the plane of the point means that the hook goes in and stays in whether the angler chooses barbed or barbless versions. We often call this pattern ‘legendary – and with very good reason! Often emulated but never replicated.